Hello lovelies. How are we this happy hump day? Recently I have been attempting to balance launching the Homely Creatures product range with freelance work and getting our place ready for visitors. I can't tell you how much I enjoy having guests over, especially when they are friends from London who I haven't seen in ages. My inner house wife comes out and I transform my disaster-zone-esk office into a welcoming guest room. The office/guest-bedroom has a different character to the rest of the house because this is where I keep a lot of my fun, colourful and quirky homewares. 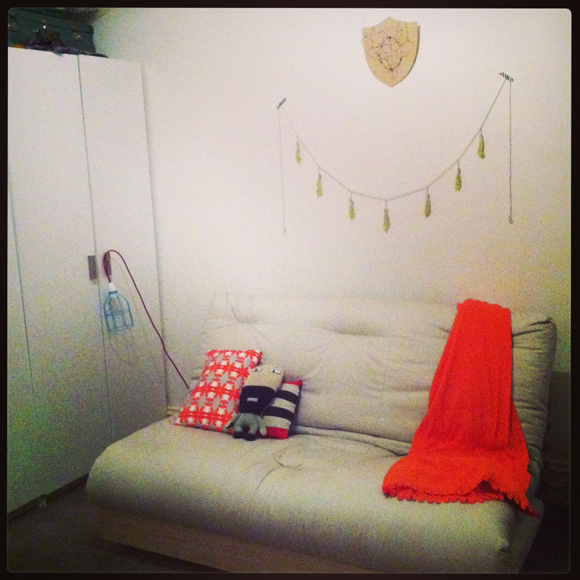 In this room, I explore my love of bright colours and craft with my handmade wire fox bust and neon dipped tassel garland cheering up the wall and centring the room. To accommodate guests as well as my sprawling craft projects, we wanted to get a couch that doubled as a comfy bed and didn't take up too much room. Easier said than done when most sofa beds don't fit through the bedroom doorway, as we found out the hard way. Thank goodness a friend suggested we check out the Futon Factory for custom made and affordable futons made in Australia from quality materials. We also got our beautiful timber bed base from them, which I'll have to rave about in another post about our bedroom. Stay tuned for sneak peeks into the other rooms of my house.